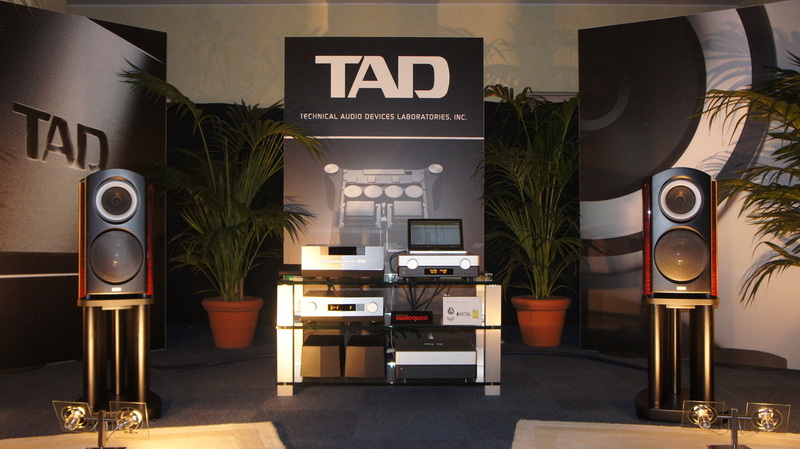 Last December we visited Total Dac and this time, my friend Pietro and me, went to Geneva to listen to the new Goldmund Apologue System, that was presented in these days in national and international magazines and forums. First of all I want to reassure you all: Goldmund exists. Here in Italy there were rumors about the fact that Goldmund wasn't in business anymore, but our visit on the 29th of August has demonstrated that Goldmund is alive and kicking. 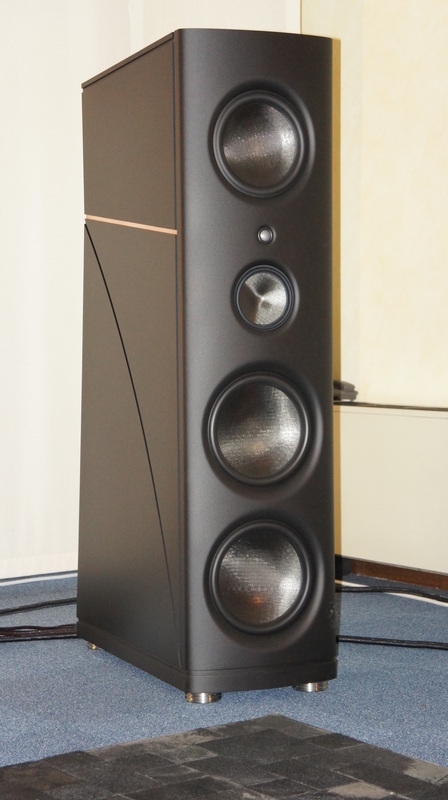 Actually, the new production of the Apologue system of loudspeakers, the Anniversary Limited Edition, is the proof that this firm is thriving and is always attentive to all the market’s need. M.Michel Reverchon & Co’s brand is very active in the Far East where they have a big market share. Their production answers to all the modern needs of listening, technique and also lifestyle. Their design is very accurate (simple shape and high-tech aesthetics) and with some operational solutions that simplify their positioning in a room. One principle must be clear: Goldmund is luxury, extreme at times, and also good quality. And Goldmund wants to emphasize this. In fact their laboratory shows their aspiration. Side by side with Goldmund there are other luxury brands such as Patek Philippe, Rolex, and - as you can see in the picture taken from the window of the Goldmund’s meeting room - the Modena Car S.A. that sells cars such as Maserati and Ferrari. 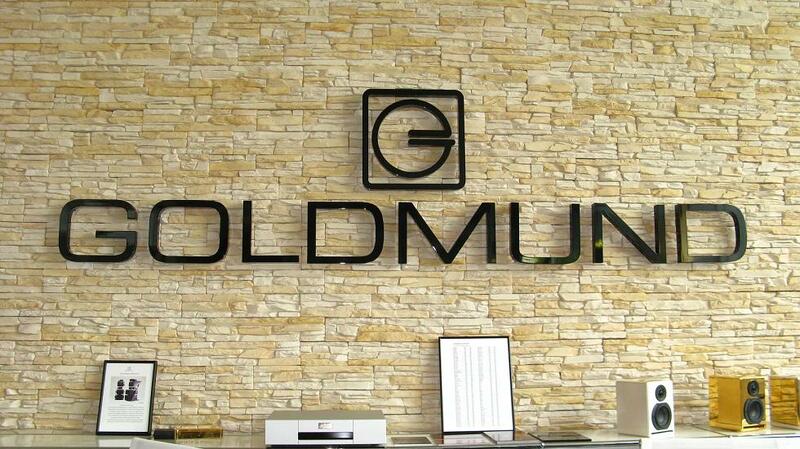 Goldmund is famous for its high quality products and this quality is evident even watching their stuffs. The finishing, the thickness of the loudspeakers’ cabinet - see the picture of the cabinet of one of the small models - that are now all in aluminium to fight resonances in the cabinet that would distract from their ultimate goal that is to reproduce as if it was the original acoustic event, just like the sound engineer has recorded it. All this with the perfection of the aesthetic form of their devices. 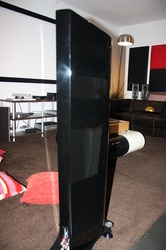 Goldmund, as we said, knows what audiophiles want, in fact all the loudspeakers are amplified and wireless so there is no need for cables that in modern hi-tech environments can bother. The amplifiers are all inside the loudspeaker cabinets, therefore the only visible cable is the A/C cable that is put in an almost invisible position. 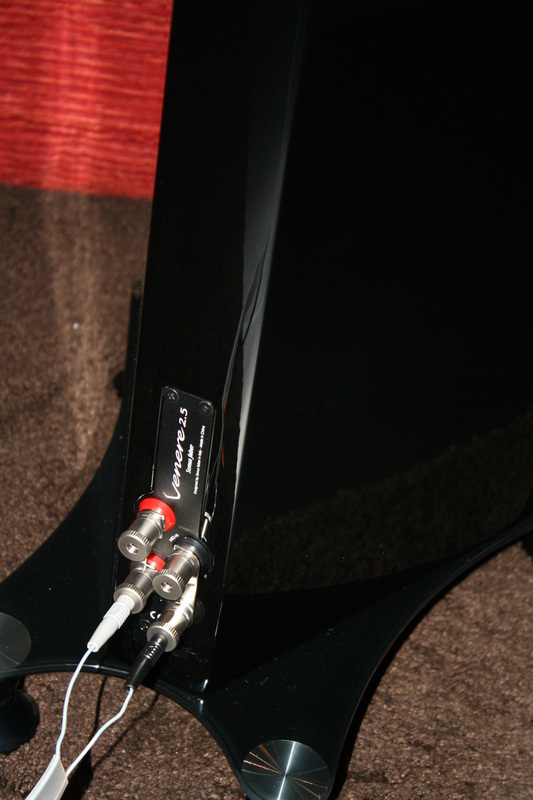 Anyhow the Swiss brand has envisaged to add to normal cable connections, if the audiophile wants to use cables because he likes it better than the wireless connection. 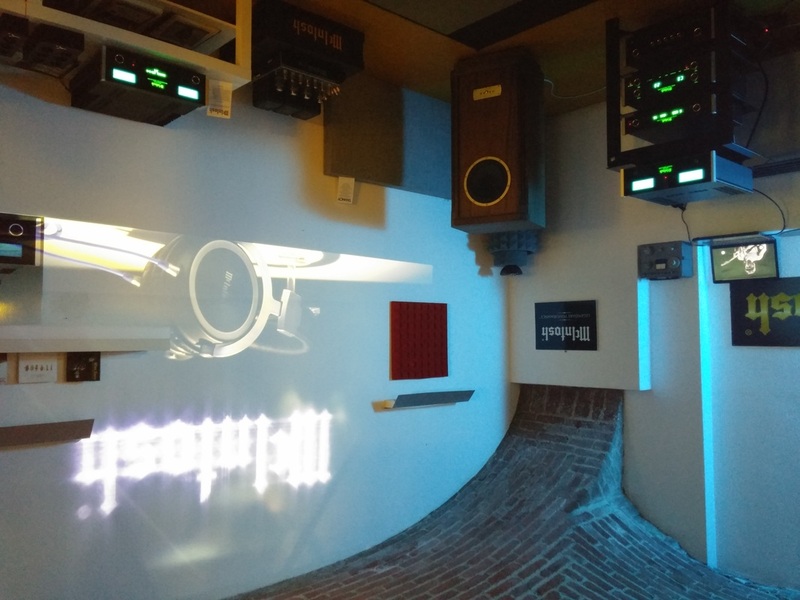 In the recent production there are multichannel products, a sort of home theatre that winks to the eastern market where there are multichannel programs from concert halls from all over the world. You can take a look at some of these products in the picture taken in the Goldmund’s meeting room - the three small cubes on the right - but also in the picture with the two system that are the smallest of the hi end section. What about analog? Studio, Studietto and Reference belong to the past and not to Goldmund’s future. The sales policy of this brand in very interesting. They are looking for “partenaires”, that is to say distributors that are up to the situation. Distributors, in fact cannot buy just one item for demos, they have to buy the entire catalogue to be able to give to clients a prompt assistance in the remote event of problems. Goldmund likes to take care of the demos that distributors do around the world, therefore they guarantee their presence on the spot. Another trade strategy is that of opening Goldmund boutiques in the most important commercial areas side by side with the prestigious griffes of high fashion. In Geneva there is a small museum still under construction. 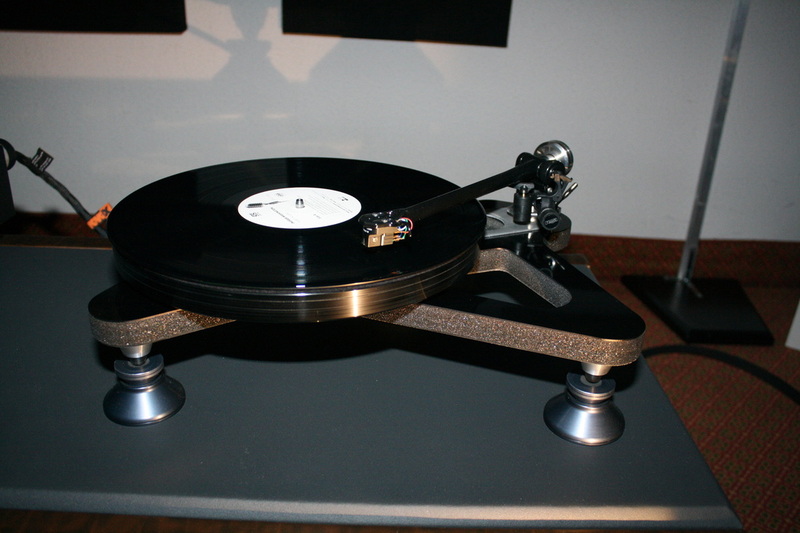 Many people would be surprised seeing that in its early times Goldmund produced also valve amplification. You can find there also the Goldcubes and Mimesis 3 that I had in my house many years ago. It’s impossible not to mention the new edition of the Apologue that were so popular in the 80’s. 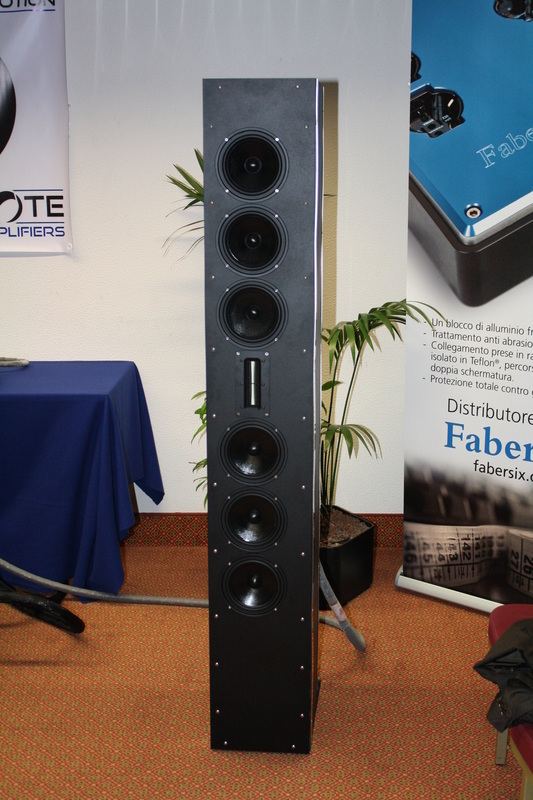 Today the system has a built-in amplification, with a wireless input signal and the aluminium cabinet. This aluminium cabinet is so heavy that the lucky customer will welcome 1 technician, 3 other people that will take care of assembling the system and the sales manager of the Swiss brand. 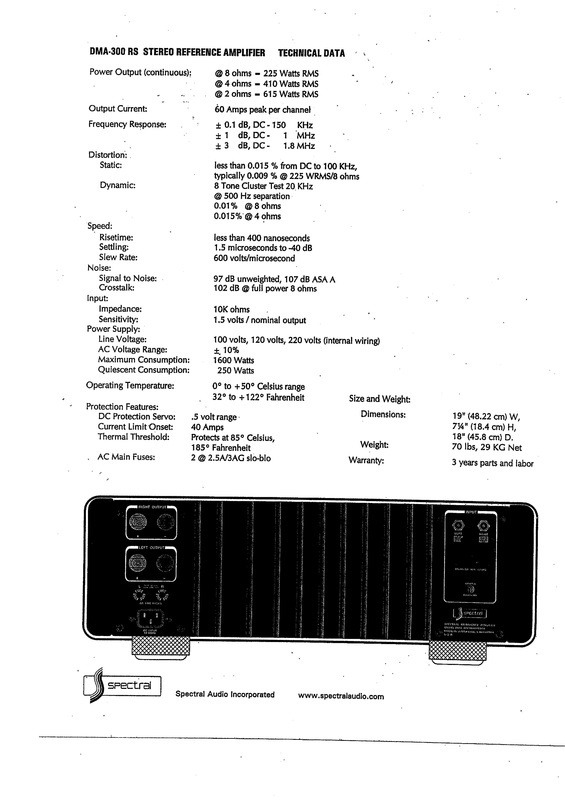 Pictures show that the Apologue only need the AC cable. As for the sound, it is really moving. I cannot say much more, because the listening was done in a room that I do not know. Anyway I can say that the listenings done showed a great ability in reproducing all details, correct and very natural timbres and the presence of a zesty dynamics. 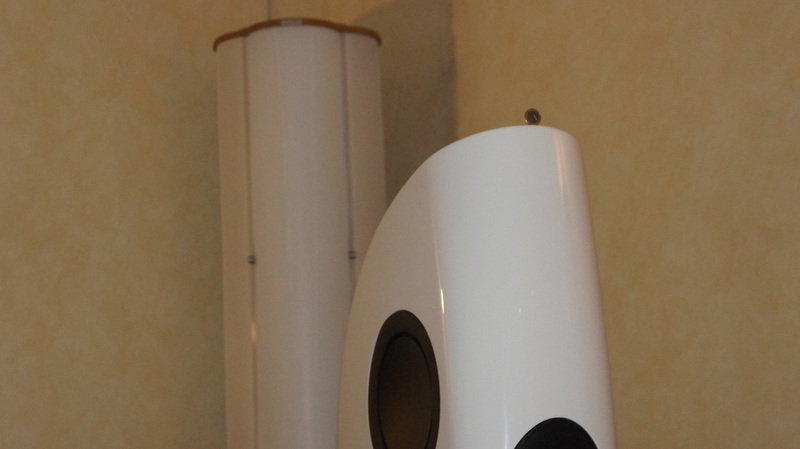 The new Apologue are similar to the old ones as for the aesthetics but have a different woofer, with a bigger diameter and two mid-ranges instead of the old unique component. The customer is always very considered; in fact also in the room in Geneva everything is looked after but in a way that remains very close to what the customer will have in his listening room. 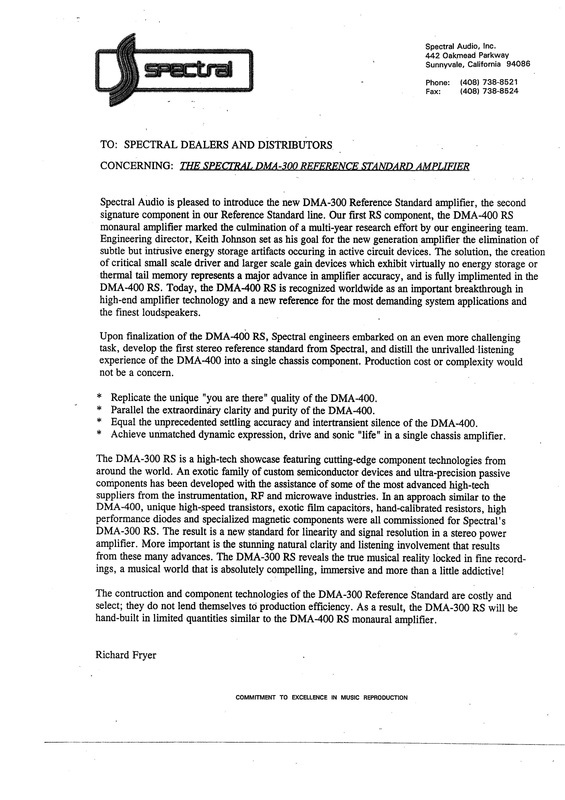 It is very likely that on these pages a review of a Goldmund component will appear. I want to thank the Goldmund sales manager, M. Rodolphe Boulanger, that has explained us what I have written here and that has patiently awaited while we were listening to the Apologues. A very warm welcome in a setting utterly ordered and very clean. Thanks also to the designer in chief, Mme Véronique Adam - yes, Goldmund’s designer is a charming lady - that has followed us during listenings. 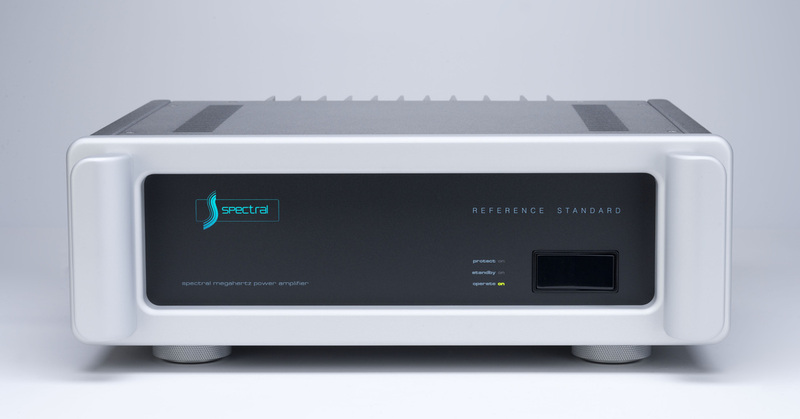 Spectral Audio's Rick Fryer has just introduced the new Spectral DMA-300 Reference Standard amplifier in Italy, in a town close to Milano. 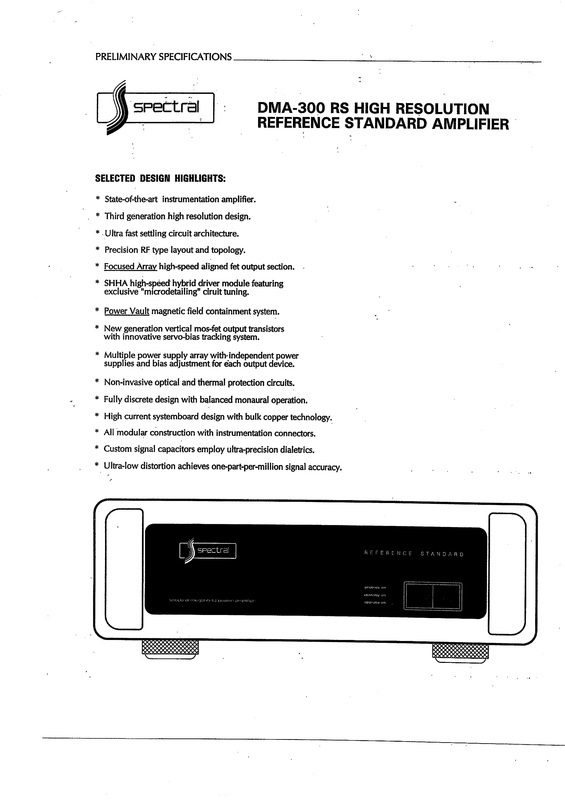 This is a second generation amplifier, after the DMA-400 RS. You can read its specifications and technical datas in the papers below. For further informations, please watch the video that follows, where Mr. Fryer explains the news about the design. Stefano Zaini is the typical man from northern Italy, a hard worker with many ideas. He's the one that organized for the first time the show we're writing about. 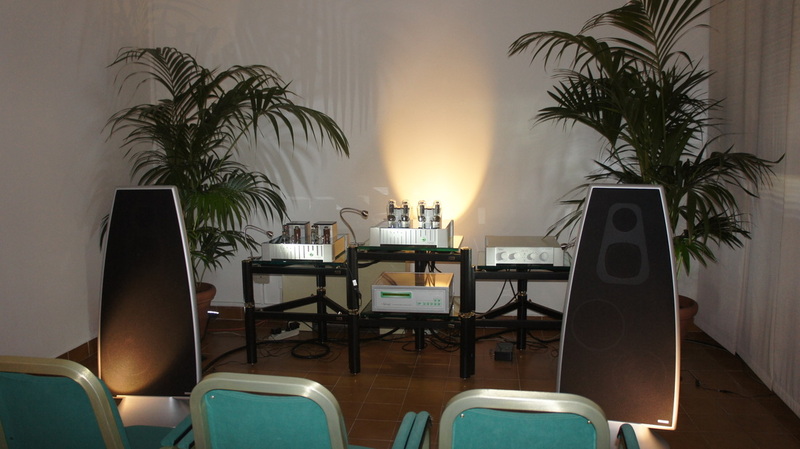 Milano hi-fidelity 2013 is celebrating this year its 14th edition. He organizes also the Rome hi-fidelity, that is a smaller and younger version but it's very important. 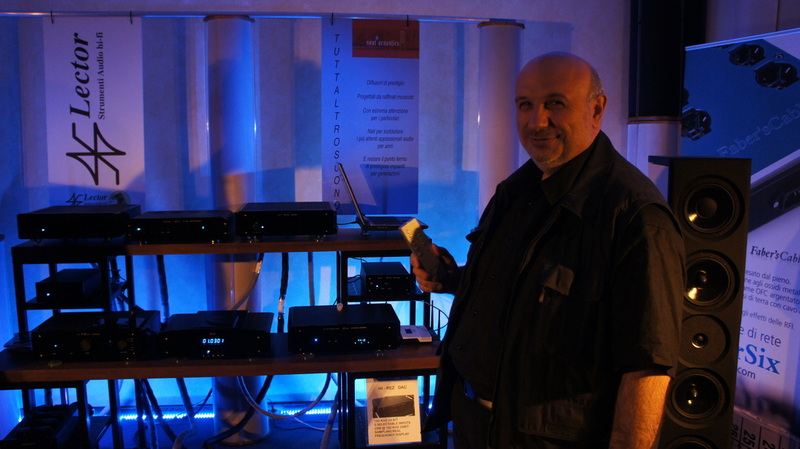 Stefano Zaini's main business "The Sound of the Valve" was established many years ago, but to Stefano it wasn't enough, so he started to organize these audio shows. A show of this kind was organized also in Sicily but, for unknown reasons it counted only one edition. 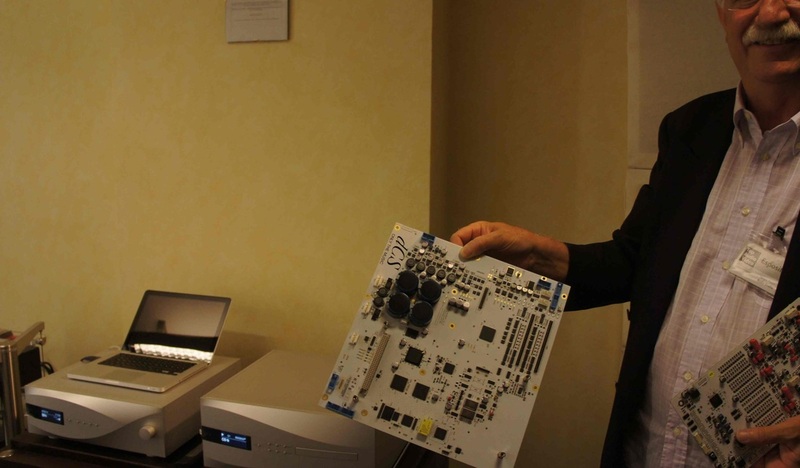 Top Audio and Video Show already existed in Milan, when the Milano hi-fidelity was organized for the first time; was another audio show really necessary? Yes, and the reason lies in the second part of the name: Video: Those were the multichannel audio years and multichannel was strictly connected to video at that time. 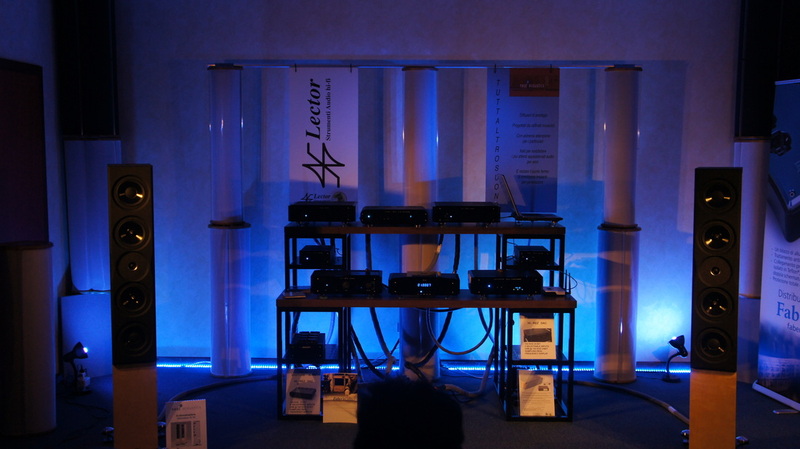 Many purists (manufacturers and customers) took advantage to exhibit in a show that allowed only audio and strictly two channel audio. Nowadays that in Italy (not worldwide) the multichannel is dead this show seems to have lost reason to exist but Mr. Zaini continues to organize it and numbers state that he's right. This year we had a little stand to promote our online magazine and we are glad we spent the week-end working. 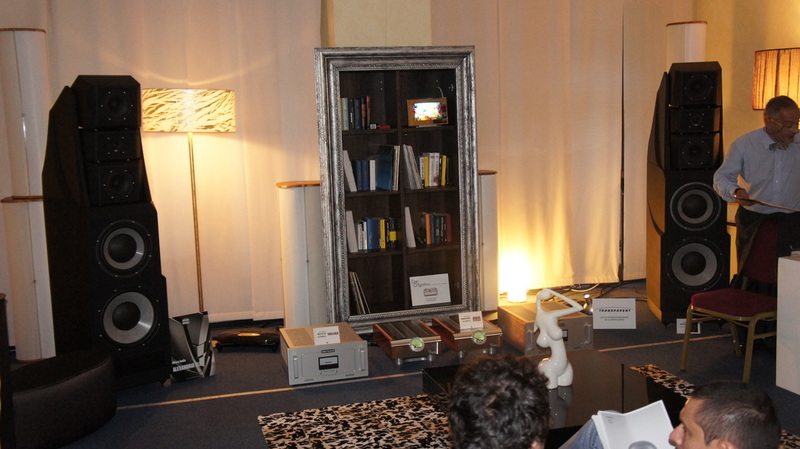 Hundreds of audiophiles stopped to watch the monitor that showed the pages of our magazine and to ask questions. Many of them confessed to be acquainted with the Team but not with Audio-Activity yet. Our magazine is too new to be known as much as we would like to. Now we expect an increase in the number of readers and we will keep on working to diffuse our wonderful hobby. Talking about the audience we can say that it was more or less the same of the last year, Saturday was a busy and crowded day until 2 p.m more or less while Sunday was less crowded. Despite this some rooms have been packed all the time and it was really difficult to hear music with some kind of concentration. Maybe you have noticed the real time report that appeared on our pages. Now we want to show you what we considered more interesting for some reasons, because it's new or because it's an original design, because ... just because we wanted to take a pic, for no good reason. 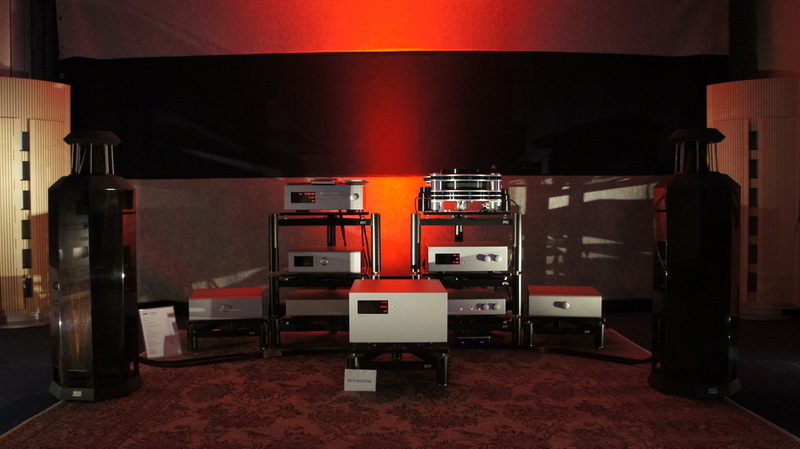 Omega Audio Concept: a new entry in this crowded market, but with atypical products. 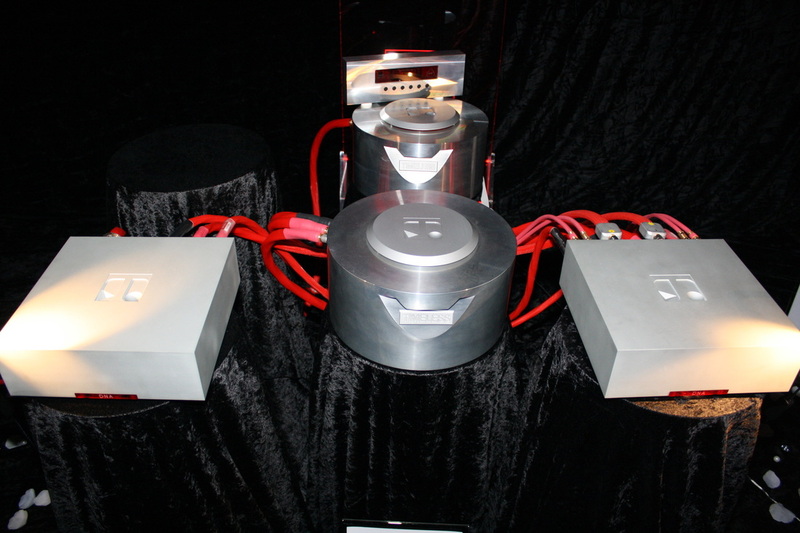 In the picture, the loudspeakers Soundwaves "micro"
Again from Omega Audio Concept, the two chassis CD player "Timeless Exceed" and the integrated amplifier (in two chassis too) "Timeless DNA", with some interesting design characteristics. Cables "Elements DNA Serie"
By Max Magri, design and owner of Grandinote, the prototype of a loudspeaker that sounded, when we listened, in a very impressive way. 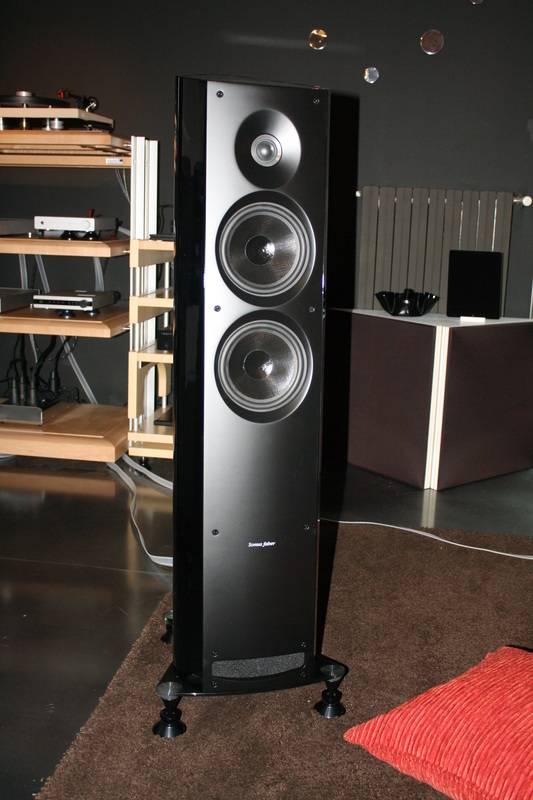 It happens that on a rainy Saturday morning when the motorbike is in the machine shop, I decide to go to a Hi-Fi shop in Milan and once I get there I find a pair of brand new Sonus Faber Venere 2.5, perhaps the first ones delivered in Italy. For a lucky shot I have my reflex and the CD test I rarely use for on-site evaluations, in my bag. Thanks to all of these sheer coincidences I have a review on the sound of this long awaited product - Sonus Faber Venere 2.5 - for the first time ever. 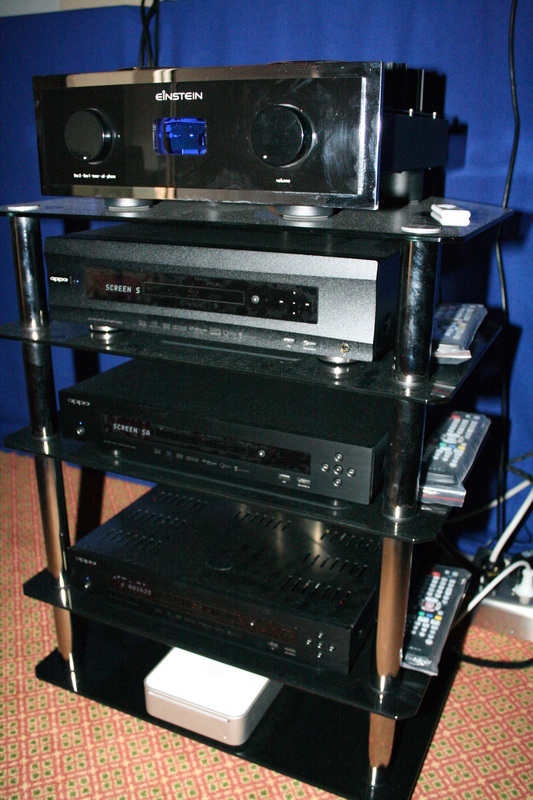 Venere has been anticipated by an advertising campaign and media hype that is uncommon in our small Hi-Fi world. 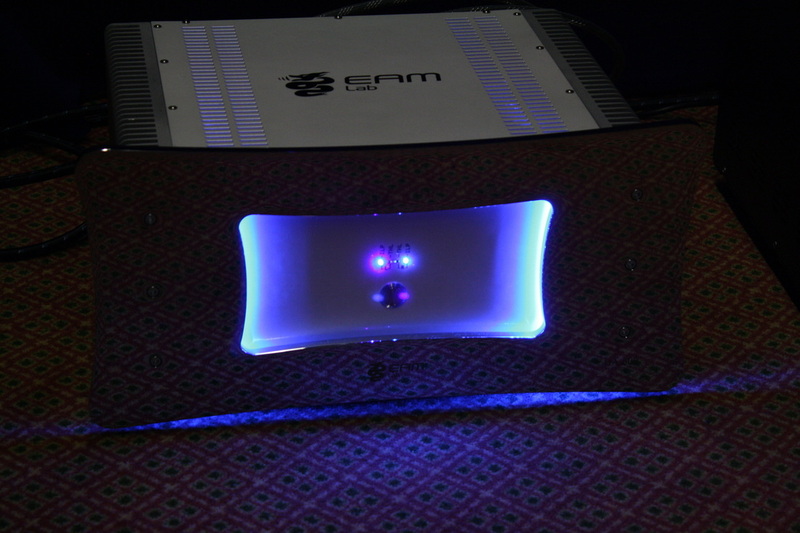 We've heard of very high profits in a three-months period with the mere orders of this product. Just for once, we rediscover niches of excellence in the different fields of our ill-treated Country. We are dealing here with containers of loudspeakers that are ready to invade the world. Containers coming from China. Sonus Faber makes no mystery of the origin of the production and the assembly of the loudspeaker specifying that the project has been conceived in the Italian town of Arcugnano (Vicenza). Just for once, the lower production costs are mirrored in the public price, the same all over the world before taxation. 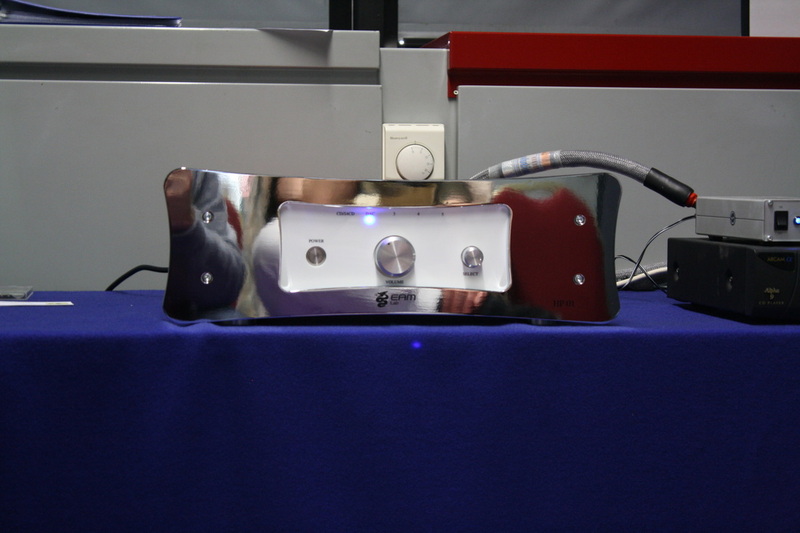 In Italy the price is 2.400,00 euros that, for a product with these characteristics and finish, is more than reasonable. I'm not used to writing about listening made outside of my "studio" or without my usual audio system. I have though enough experience to understand an equipment also in different conditions, so I'm gonna spend just a few words and write few notes for this happy occasion. 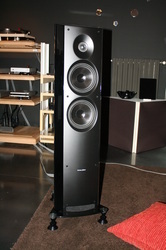 The soundstage is very good, deep and wide, with the loudspeakers focus crossing at half a meter before the listener as it always happens with Sonus Faber. The sound is full and round in the medium bass range. The lower bass is deep and powerful. Voices, and the whole medium range, are rearward and the roll off seems stable as the frequency rises. This gives the sound a characteristic very apt for the wide public. The buyers will be probably newcomers or people that love to listen at a moderate volume and without fatigue for their mind. 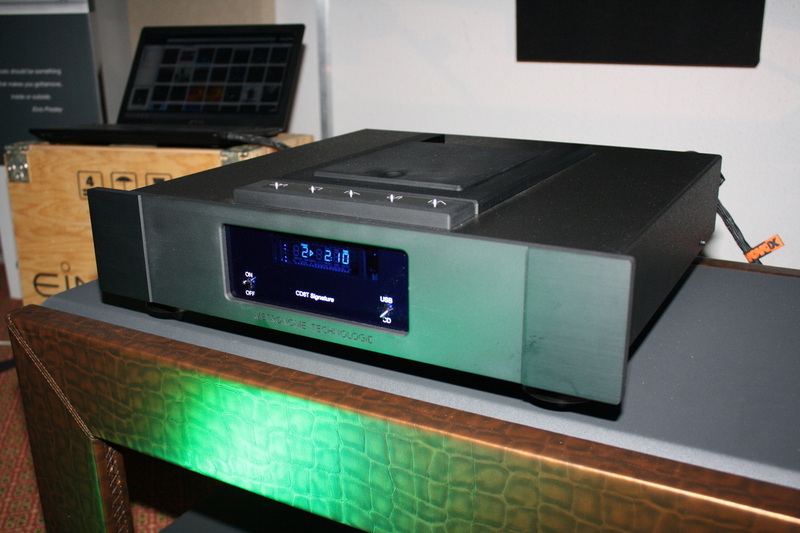 If Sonus Faber had in mind to reach all the consumer groups outside the niche of the Hi-Fi passionate, their goal will probably be met with success. This product is a wonderful synthesis of design and functionality. One last word: when you'll listen to them you will be bewitched by them, but don't panic, it's normal, they are really gorgeous. note trying not to be boring and predicted. The number of exhibitors was reduced if compared to that of the previous years. On Friday also the crowd seemed thinner than ever. I 'm sorry about it because TAV is a free show and I wish it was more appreciated. Unfortunately Italians sometimes are very keen on criticizing and don't appreciate what they have. I hope this is not the case but if TAV should come to an end we'll all regret it. This year I haven't found rooms of outsiders and all the rooms of the "big brands" were very interesting. The best basses were those of Audiograffiti: the bass control of Magico Q7 is stunning. 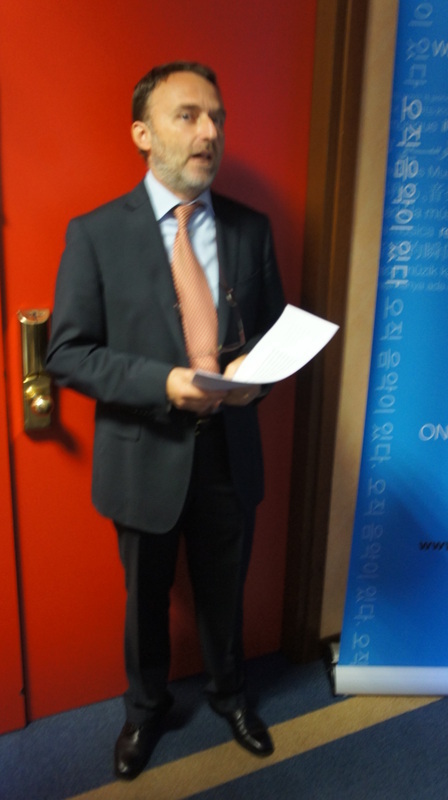 Sergio Pozzi, with the board of the new dCS. He wanted only his nose and his moustache shown in the picture....he's a shy guy, you know! At the entrance there was Emilio but he's not up to the other girls that were in charge of Hospitality. 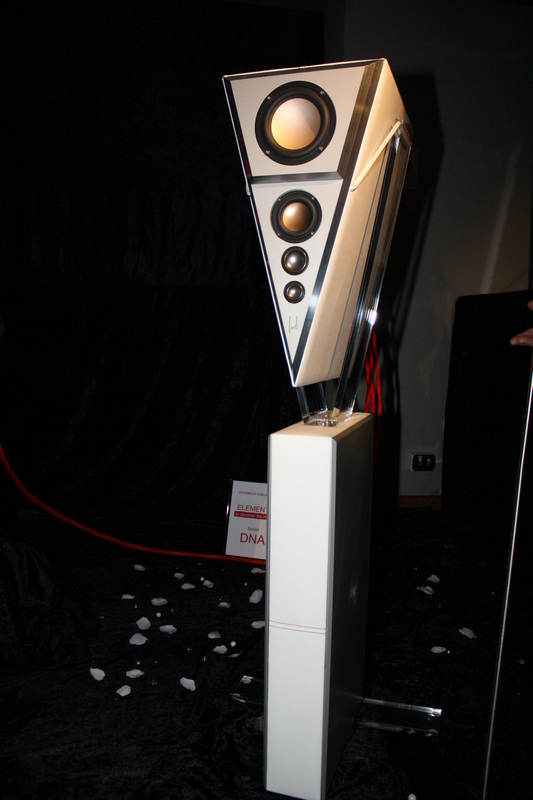 Low frequencies almost co-winner for Kef Blade. The exhibitor had put a coin on the loudspeaker playing at full blast Pink Floyd's The Wall to demonstrate that loudspeakers don't vibrate....and the coin did not move! I was a bit deceived by Alexandria XLF that I listened to in two different moments. I'm sure it was a matter of set-up and of an environment not really fit for these big loudspeakers. 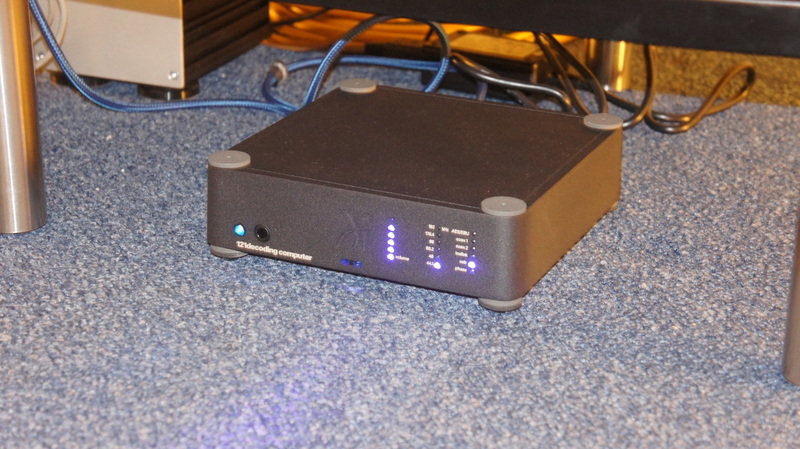 Source and pre-amp Audio Research and power amps ... 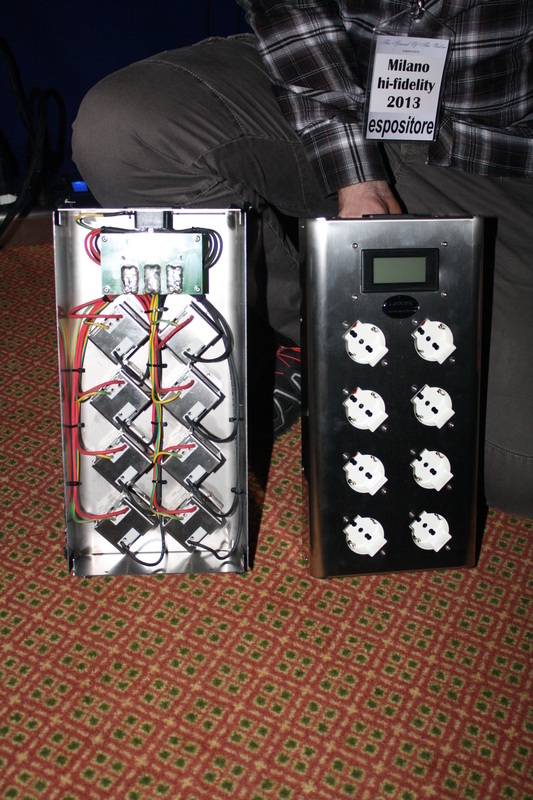 I don't know if D'Agostino o Audio Research, I didn't ask but most of the times they used D'Agostino amplifiers. 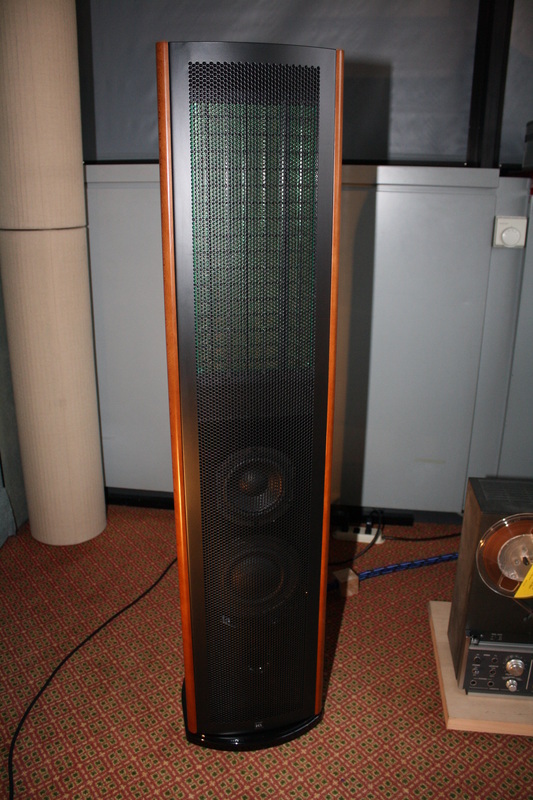 Nice surprise in the LP Audio room where the German Physiks with loudspeakers Soulution seemed to play better than other times. Omnidirectional is not easy but this time it was really ok. I want to highlight three rooms that impressed me. 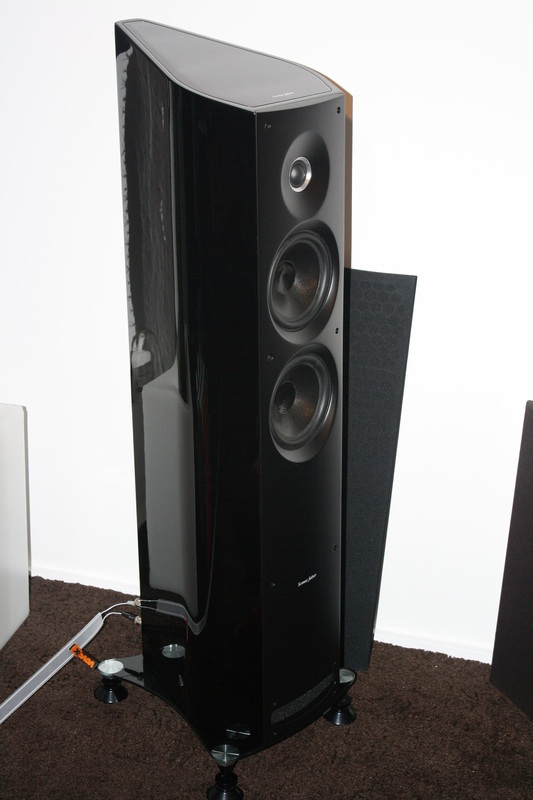 I liked Voxativ Ampeggio, it's the first time that a loudspeaker so different attracts my attention. OMG, am I getting old? let's not think about it! They told me the designer is a very nice person and I want to express her my appreciation. 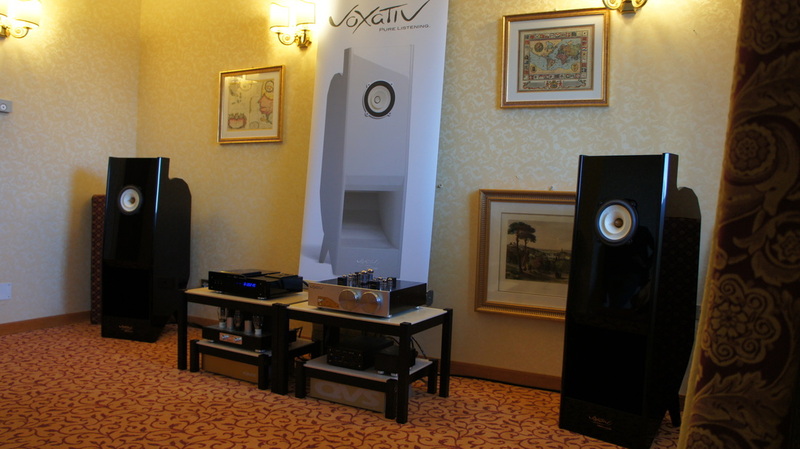 Another nice room with an interesting sound and a dark-blue look was the room of Claudio Romagnoli - engineer - with the Docet-Lector electronics matched with loudspeakers NEAT distributed by Andrea Bernardi's Tuttaltrosuono. I kept for last two unique rooms. 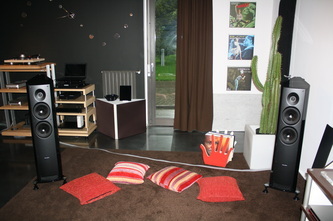 Music from a Hi-Fi equipment must be "easy" and in these rooms it was. 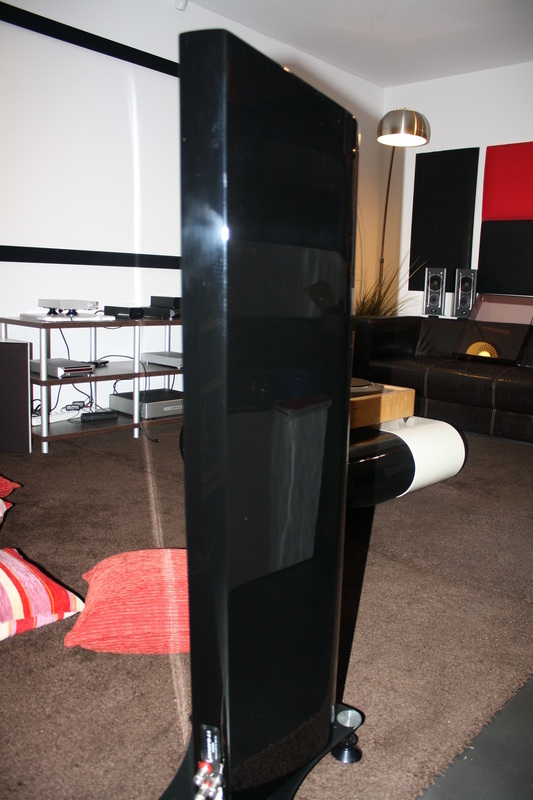 The bass you don't expect from planar Leonardo Speakers with Kronzilla valves and a very high coherence; well done Aldo Zaninello. Another good reason to visit TAV is the chance to bump into friends and big names. 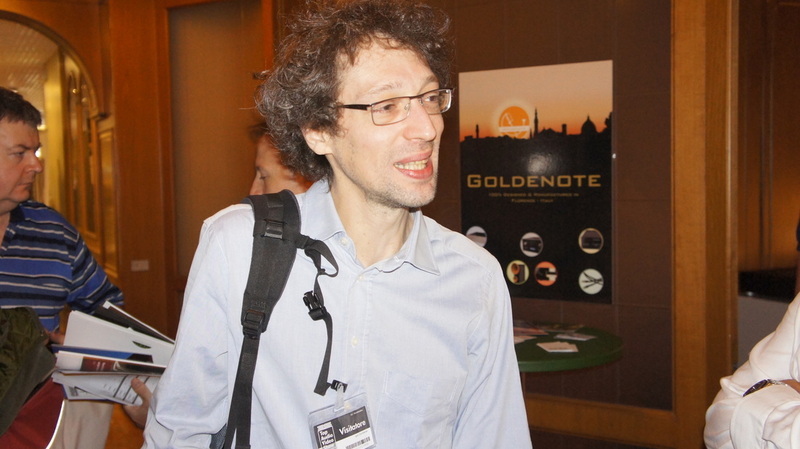 Igor Zamberlan, a top performer of Hi-Fi components analysis. ... and a rising star, a Sicilian designer with a funny last name (Sonus Faber designer Livio Cucuzza) that was walking around trying not to be noticed but with those mustache ... mission impossible! That's it for now, see you next year - I hope! To complete the real time report from the Top Audio Video show , considering the poor quality of the pictures we took hurriedly and with a smartphone, we offer you a gallery of pictures, some of them "official", others more curious. Enjoy them and thank you for following us.